Well if you were here yesterday, you know a little bit about this week’s featured Kickstarter campaign. The folks at Dice Hate Me have found another diamond in the rough and they are in the midst of yet another successful campaign. 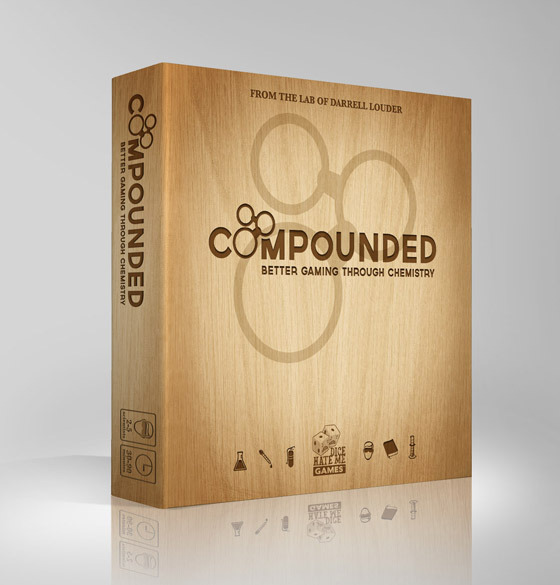 Compounded boasts “better gaming through chemistry”—it’s a game of gathering elements, and compounding them to create…well, compounds. Players are scientists who are sharing a lab, and a limited amount of resources, elements, and lab tools, as they try to finish more compounds and score more points. 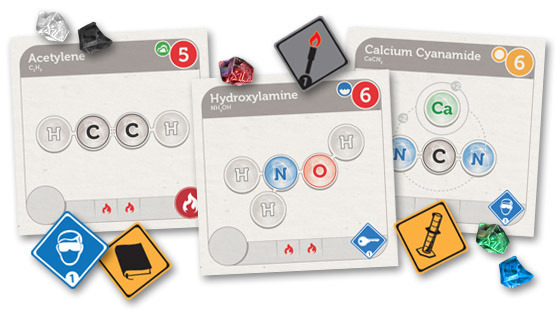 For more about Compounded the game, you can check out our interview with designer Darrell Louder by clicking this underlined text. Compounded is already funded and has blown past the first stretch goal! You can do your part and pitch in $8 for a couple of snazzy buttons to add to your flair. Or for $42 you can get yourself a copy of the game and all the applicable stretch goals. You can check out the campaign right here. Today’s interview is a preview to tomorrow’s Kickstarter Weekly. We’re chatting with Darrell Louder, the designer of Dice Hate Me’s Compounded, which is chugging right along on Kickstarter. Hey Darrell! Thanks so much for taking a few minutes to sit down and give us the answers that inquiring minds want to know! First let’s start off by having you tell us a little bit about yourself. My name is Darrell Louder (yes, last name is my birth name.) I’m a 33-year-old graphic & Web designer—I guess game designer now as well. Father to a handsome 2-year-old named Ethan, and husband to the greatest woman in the world, Lesley. I work for Game Salute as their Web site administrator and a member of their graphic design team. I also tend to do freelance design for a few people when the need arises. Compounded is your first game design that’s getting published; is this your first ever attempt at a game design, or have you been beating down doors trying to get published for a while? Compounded is my first game, period. I never had the desire to make a game before, as I was totally content playing the games that my friends would bring over. Compounded only came about because my friend John Moller started a ‘revolution’ called the Unpublished Game Festival, now known as Unpub (http://www.unpub.net), in 2011. Four days prior to the event, I was concerned he wasn’t going to have enough game designers in attendance, so I made Compounded. It was received pretty decently, and I was urged to continue working on it—so I did. I kept working on it that year, bringing it out every now and then to playtest, but that was it. It never left my hands or our play group. 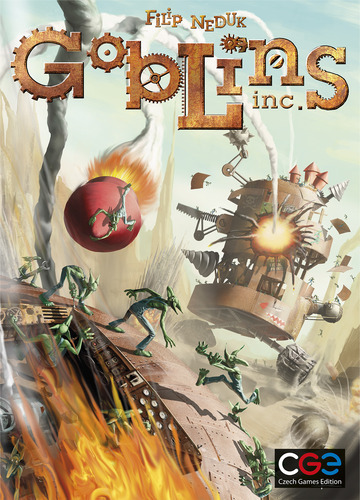 So…a game about science; how did you land on that? Are you a science geek, or did it just sound like an interesting premise for a game? Well, this is a funny story. 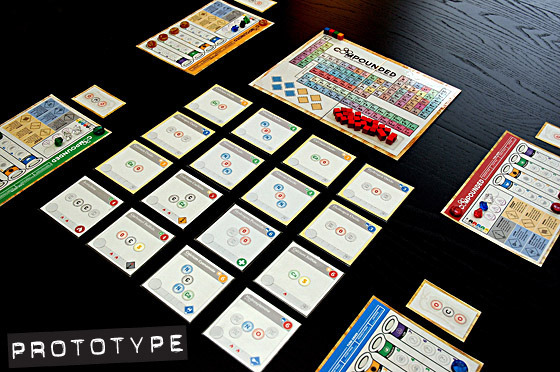 Initially Compounded was going to be about mad-scientist alchemy. Same mechanics, but instead of Hydrogen, Oxygen, and the lot, it was rat tails, snakes, etc. Before I built it out though, my wife questioned it. She pretty much said to be original, and that the alchemist track would be “white noise.” She is an AP English teacher at the local high school here, so she immediately recommended using real compounds and elements. That was it. It was one of those EUREKA moments! My grandfather was a zoologist, so I was raised knowing about science and nature. So there was no questioning it; I had enough info from my childhood and schooling to get started on it. Add in a bit of research and BAM! It was just a perfect marriage of ideas and my childhood. How long have you been playing games like this? And what made you want to design one of your own? I had been playing a little game known as Magic: The Gathering for about 15+ years. So I shunned all other games, as I was one of the ignorant Magic players that thought all other games were cheap and stupid. Turns out, I was the cheap and stupid one. 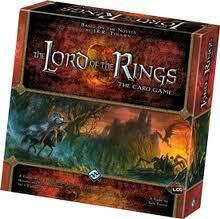 I gave in one day and tried Reiner Knizia’s Lord of the Rings, and I was hooked. Then came Catan, Carcassonne, and the usual lot. I still stuck with Magic, but my eyes were opened to the entire hobby of gaming. As I said above, I only designed a game for Unpub. Before that, I had no desire to do it, as I thought all others have done well enough. Tell us how you ended up with Dice Hate Me. Then in the fall of 2011, John took it down to North Carolina with him (at my request) to playtest it with Chris and Cherilyn of Dice Hate Me Games. Now, this wasn’t to pitch the game to them; this was just for feedback. I had made friends with Chris and Cherilyn over the course of a few months through Twitter. They have very similar game likes and dislikes that I do, so I thought their advice on gameplay would be helpful. I honestly wasn’t looking for publication—heck, the game was only 6 months old! So anywho, John came back with the game and suggestions from them. I did those changes and liked the improvement of the game. So I ran with that for 6 more months to Unpub2. Chris and Cherilyn came up for the event (this was the first time I met them in person), and within 30 minutes of meeting them they asked for the rights to publish Compounded. So, really, I got incredibly lucky. My path is incredibly rare, and I am incredibly thankful for them for making my first design so easy! Wow, great question. Knee-jerk I have to say my Grandfather (Darrell Louder Sr.) but you probably mean famous, so I have to go with Michael Faraday. He’s known as the grandfather of science, and is credited for giving so much to the field. Give us your top 3 games and why you like them so much. What are some of the benefits gaming provides us? What are some of the downsides? The downside, beside the dreaded gamer-stink (seriously, SHOWER when at conventions) I would say distractions. I get distracted a lot wanting to play a game or work on a design. So I have to fight that urge to get my job done first. Yes, friends don’t let friends leave the house with gamer-stink… Wanna give us a spoiler on the third stretch goal for Compounded? What can I say. Let me say this: Chris and Cherilyn (of Dice Hate Me Games) care first and foremost about the quality of the games they put out. So the first thing you’ll notice with this KickStarter campaign is that there are no “KickStarter Exclusives,” and there are no bags, mouse pads, coats, cars—everything goes 100% toward the game and making the game components the absolute best they can be. The third stretch goal will continue that trend, and will be great. Out of all the goals, I can honestly say the third one is the one I am most excited for, and the one I really want to see become a reality. Ok, here’s the One-Word Answer section: Answer the next 5 questions with only 1 word or phrase. If you could own a REAL ship from Star Wars, which one would it be? Yes or no, have you ever gone around banging two empty halves of coconuts together? Yes, very much so. I ain’t ashamed of it either. Neither. Not a Battlestar fan, sorry. Darrell thanks so much for taking time to tell us about Compounded! You can find Darrell on Twitter at @GetLouder, and you can check out Compounded on Dice Hate Me’s site right here and the Geek right here. And come back tomorrow for more about the Compounded Kickstarter Campaign! And don’t forget to like us on Facebook, and follow us on Twitter! Thanks again for reading! Well, we’ve certainly done our share of gushing over this game, but we’ve never actually given it our full, in-depth review. Until now. If you’ve never played a living card game (LCG) before, know this: The rules are deep and complex, and they’re very similar to a collectible card game (CCG)—the biggest difference between the two is market collectibility. A CCG is distributed through starter decks and booster packs that randomly give you the cards of a 200-300 card set. An LCG releases the complete set in an expansion, so you’re not trying to buy pack after pack after pack to get that one awesome card. You know exactly what you’re getting in every pack, and my pack is going be the same pack you get. 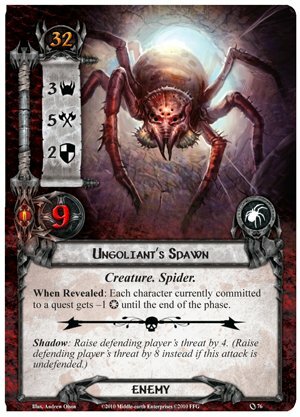 The Lord of the Rings: The Card Game, which I will refer to as LOTR from here on out, delivers what everyone would want in a CCG, but puts it in a co-operative format. It’s quite simply one of the funnest card games (LCG or CCG) I have ever put my hands on! The Core set of the game includes a starter deck of 4 spheres of influence (you’ll see more about that later), several sets of encounter cards, 3 quest decks, 2 threat counters and all the various tokens you will need (progress, wound and resource). The game is designed for 2 players…or is it? With the purchase of a second core set you can expand to 4, and the design actually scales very well for anywhere from 1-4 players (yes, you can play a solo version!). Players each control three heroes which come from 4 different “spheres of influence” in Middle Earth: tactics, spirit, lore, and leadership. As with any LCG or CCG, deck customization plays a big part in terms of your success or failure. I won’t go into the ins and outs of deckbuilding here. I will say that there is a group of 4-6 of us who play together, and we’ve all sort of taken ownership of our own sphere, and we all play with mono-sphere decks. It has its advantages and its disadvantages, but it’s seemed to work for us for the time being. Because the game is co-op the player turn is set up slightly differently than a standard card game. Instead of each player going through the different phases of a turn, completing their turn and then play moving on to the next player, players in turn walk through each phase of a turn or round. For instance, after the refresh phase in which players give each hero a resource token (money) and draw a card and pass the “first player” marker to the left, players start the planning phase. Whoever was just passed the first player marker now plays cards from their hand, paying the appropriate resources to do so. These are typically items or allies to add to your party. But instead of moving on to the quest phase, the next player then performs their planning phase, and so on. During each phase players are encouraged to discuss their strategies and what they are doing, making it one big team effort. You’re not supposed to reveal exactly which card you’re holding in your hand but you can definitely talk about the abilities that card will give you, or your teammates. So we’re all in this together…well then what are we up against? Aside from each players’ deck, there are two other decks involved in the game. A quest deck, and an encounter deck. The Encounter Deck—It’s full of baddies, locations, and other stuff that you will have to encounter during the game. Defeating enemies is not how you win the game, but they can certainly be the reason you lose the game! Traveling to locations can earn you certain bonuses or penalties depending on where you are going. The Quest Deck—This deck is usually only 3 cards, though sometimes more and sometimes less. It tells you how you win the game, and sometimes gives you alternative loss conditions as well. It also tells you which cards go into the encounter deck, which often gives you a clue as to how hard, or what type of quest, it’s going to be. Typically to successfully complete a quest you have to place an amount of progress tokens on the currently active card of the quest deck. And often fulfill some other condition. So… How does one place a progress token on the quest deck? I’m glad you asked. The two most crucial phases of the game are the quest phase and the encounter phase. The Quest Phase—Players must decide whether to commit their heroes and allies to the quest; if they do, they exhaust that character, and turn the card on its side (just like tapping in Magic The Gathering). This means that the character cannot attack or defend any baddies coming out until the next turn. But their “will” is committed to the quest and cancels out an equivalent amount of threat in the staging area (which is where the bad guys live after they come out of the encounter deck, and before they attack). 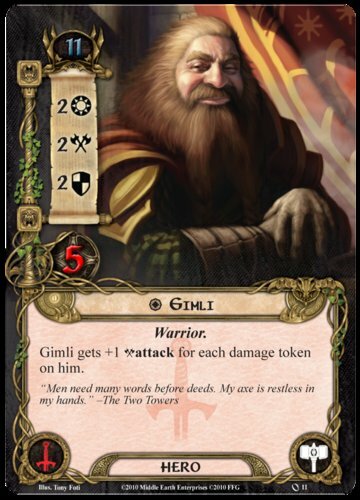 After the last player has committed characters to the quest, out comes one encounter card per player in the game. Each of these cards have a threat level on them which adds to the threat in the staging area. AFTER these cards are revealed, if the total amount of committed will is greater than the threat, then players place progress tokens on the quest (or active location they have traveled to) in the amount of the difference. If not, then each player increases their threat level by the difference on their threat counters. (Hitting 50 on your counter signifies the end of the game for you!) Okay, take a breath. Still with me? Good. The Encounter Phase—Things get hairier in the encounter phase. Players can choose to engage any of the bad guys in the staging area, or let them engage you later. It’s often helpful if someone is primed for fighting to have them engage a tougher opponent so they don’t beat on your friend who isn’t ready to face such a battle. Each decision piles up on the next, because there are mechanisms in place that will cause enemies to engage players based on your threat counter. And, if you have all of your characters committed to the quest, you’re taking damage points that get turned into even more increases on your threat level. Things can snowball really, really quickly. That, believe it or not, is a very rough overview of the game play. I told you. It’s deep, complicated, and meticulous. But it is so fun! This is not a casual party game; it’s not even for the casual gamer—every decision, every card played, choosing whether to commit, to defend, to attack, everything, can make or break the success of the quest. The storyline continues through the release of Adventure Packs, each of which includes a quest deck, usually a set of encounter cards, some new player cards to continue spicing up your deck, and setup instructions (often using several encounter sets from the core set). I love this aspect of it; it’s like playing an RPG without having one person specified as the game master who has to put in hours of prep time before everyone else gets to play. For $15 you get a new quest and can have yourself a great evening. The down side is that rarely after we beat a quest do we go back and play it again. (Although there are plenty of them that took us more than one attempt!) And because of the monthly pace that Fantasy Flight maintains in releasing these packs, I’m a good $100+ behind in my chapter packs! Final thoughts and my rating—I was introduced to “gaming through a couple different CCG-type games, so this title hits home for me. And it provides many nice twists to what is usually a head-to-head genre. The game is complex, but that complexity gives it a platform to build and expand on continuously, and also gives great great depth to the gameplay. The cards all have great synergy, not only within each sphere, but cross-sphere, making each quest a true team effort, which is something I’ve come to really enjoy about the game. And the Tolkien theme is icing on the cake. I give this one a 10. Thanks so much for reading, and don’t forget to like us on Facebook, and follow us on Twitter! A Last-Minute Plea for Formula E! 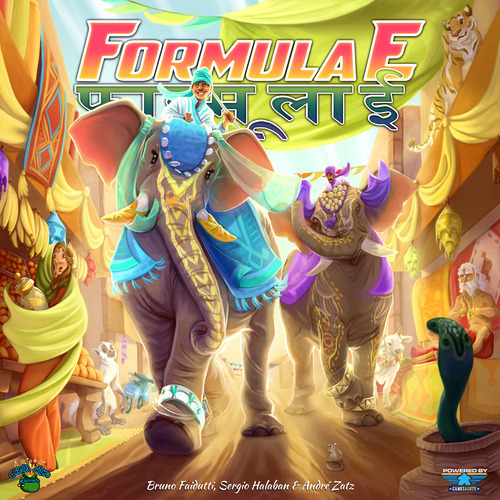 A few weeks ago we told you about a racing game from Game Salute and Clever Mojo games called Formula E. Well, with 6 hours to go on the Kickstarter campaign, they’re only $3000 away from funding the game! So if you’re on the fence, make up your mind and consider hopping on board. It looks like a fun little racing game—and racing games are great choices for nongamers and families. Inconceivable! A Princess Bride Board Game! Yes, you read that right. 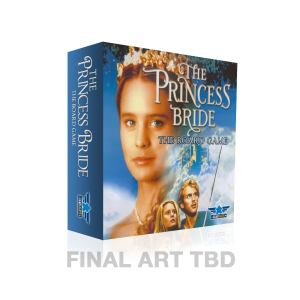 The folks over at Game Salute are putting together a board game based on the cult classic The Princess Bride. The game will be a part of Game Salutes Storybuilding line, and will tie into many short/mini games that represent different scenes from the modern fractured fairy tale. Not only that…while they are working with some of their top notch game designers, Game Salute is also accepting your submissions for the project! If you have a game design that you think would represent a scene of the movie you can send it in for their consideration. You can read the whole announcement from Game Salute, right here. Thanks for reading this announcement, and don’t forget to like us on Facebook, and follow us on Twitter! So, a few months ago we reviewed a great little deck builder of presidential proportions called Pixel Lincoln. They’re plugging away on production and unfortunately we don’t have a release date to report. 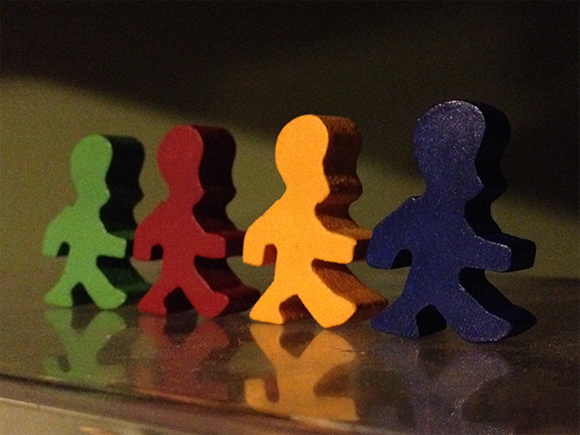 But they did leak out a photo of the production sample Lincoln Meeples on their Kickstarter page, and I have to say they look AWESOME! When we reviewed the game it was a print on demand prototype version so we had to use our own tokens to mark our movement in the game. And a game like this, while it doesn’t rely solely on ascetics, it certainly was born of a theme, and having a glimpse of the meeples we can see how they’re going to add to the game play experience!